At DPI - Alpena Hardboard, our foresters recommend management options based on the ecology and health of your forestland, while encompassing the goals for your property. When you chose to harvest timber, a forestry agreement or timber sale contract formalizes the details of what, when, where and how the trees are harvested. 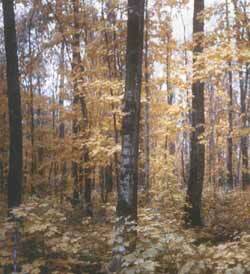 At DPI, protecting land and water resources, and promoting sustainable forestry are always fundamental objectives. 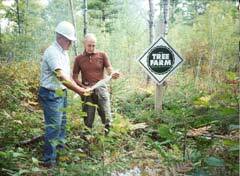 DPI-Alpena Hardboards free Forest Management Program helps guide forest landowners in northeast lower Michigan including those in Alcona, Alpena, Arenac, Charlevoix, Cheboygan, Crawford, Emmet, Iosco, Montmorency, Ogemaw, Oscoda, Presque Isle, and Roscommon Counties through all aspects of the logging and timber harvesting process. Alpena Hardboards foresters map properties, write forest management plans, perform Tree Farm inspections, cruise timber, mark timber, supervise logging contractors and buy standing timber. Our foresters are also familiar with timber markets, offer roadwork design recommendations, create wildlife habitat and food plots, and provide periodic mailings to forest landowners in this Forest Management Program. Our Philosophy: Trees are a renewable resource. A well-managed forest can provide a continuous supply of harvestable timber and become a valuable investment for you, your children and your childrens children. Mission Statement: To meet the financial objectives and needs of each forest landowner while providing for forest sustainability and protection.